Discussion in 'Houston Rockets: Game Action & Roster Moves' started by LosPollosHermanos, Mar 17, 2019. Realjad, ak99999, RyanB and 16 others like this. House is actually a good player so I have to tolerate it. But fans are approaching LOF levels with House, and I'm kinda starting to hate the guy for something that's not his fault. Raider17, Mr. Turbo, RyanB and 33 others like this. RyanB, Maxgx, Killatron 2000 and 9 others like this. BigShasta, chadyang, hakeem94 and 3 others like this. You do realize we were winning without him right? majicdonjuan, Remlap, TheRealAllpro and 9 others like this. Smacktle, clos4life, BigShasta and 1 other person like this. Maybe the reason we won’t start him is because Morey and MDA are trying to hide him from potential suitors this upcoming offseason. If this is strictly a bench guy who isn’t making much hay when the national spotlight is on, maybe he’ll fall into our range and we can match something Below a 3yr 16M Type deal. 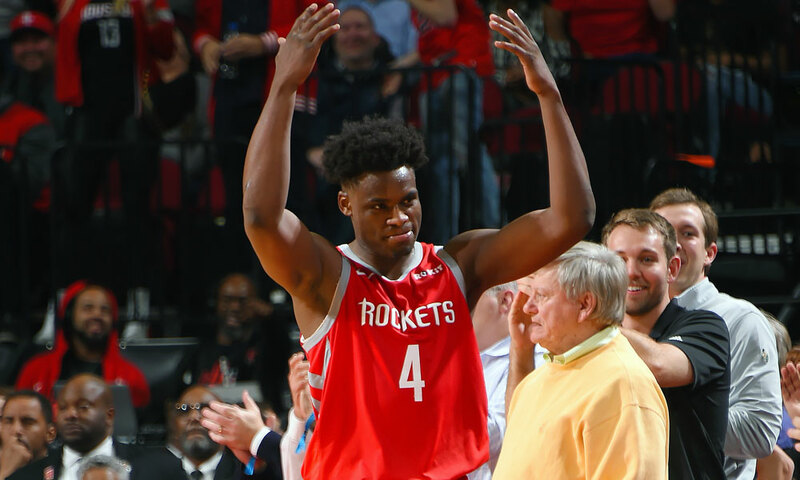 The next Ariza, Tristan Thompson, JJ redick, Harrison Barnes role player type to sign a fat contract this offseason, and no one happier to see him go than Rockets fans who can revel in their championship while another poser team somewhere goes to grossly overpay him for something heneeded Harden and Paul to deliver to him in the first place. hajkov, ramotadab, BigShasta and 2 others like this. Why do we have to have a "House divided" regarding House Jr.? Let's just celebrate our healthy team, Win and upcoming (possible) championship! Gray_Jay, saleem, ak99999 and 24 others like this. will subscribe and read again. burlesk and hakeem94 like this. I would also like to add that Jim got some extra rest tonight due to the fact we had another wing capable of creating his own shot. I have no doubt the deviltoni would have played him all game. Not so cleverly disguised House thread. Remlap, burlesk, s3ts and 1 other person like this. Drogba, s3ts, clos4life and 5 others like this. Mr. Turbo, Denovo, jerryclark and 1 other person like this. Jontro, RocketWalta, rockbox and 1 other person like this. ramotadab, Easy and hakeem94 like this. I'm not saying we dont need him. I like House. I think he's a good player and a nice additiion to the team. But the Rockets made a smart business decision in not signing House to a multiple contract year at a salary that would tie them up in the future. People on CF were hitting the panic button early in the season when the Rockets were losing and wanted to give the guy what he wanted in order to help the team start winning, which was just irrational. But the Rockets righted the ship and started winning WITHOUT House. Eventually, they come to an agreement. It was the smart thing to do. vince, clos4life, waytookrzy079 and 1 other person like this. These threads are stupid. I just took OP off my ignore list, but if he keeps doing this divisive crap about "House haters" after every single good game, I might have to reconsider. Every Rockets fan is happy when a Rockets player has a good game. I haven't actually seen "House haters". Agreeing with how the Rockets handled the negotiation doesn't make anyone a "House hater". Remlap, TheRealAllpro and burlesk like this. The people who actually don't like House are in a very small minority. You got a larger group of people who can't get his d**k out of their mouths. The vast majority of us like House, and are happy to have him back, but are far beyond sick of this s**t. I really hope Clutch decides to crack down on this crap. Smacktle, sirbaihu, clos4life and 2 others like this. You need to block out the hype and just see him for what he is - a great role player who fills a void. I have learned to ignore what others are crowing about and judge him based on his merit. I'm glad we have him, but realize that he's not the Rockets' savior. Remlap, MONON, PDJACK7 and 1 other person like this. ilovehtownbb, Madmanmetz, PDJACK7 and 4 others like this.